There is another river in the Carcassonne region. 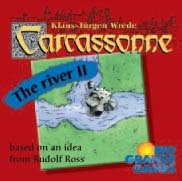 Like the first river, you can use these 12 tiles to start a Carcassonne game instead of the normal start tile. But, there is more. It can be used with the other river, to make an even longer river to start the game. It has a branch, so you get the effect of two rivers instead of one. Its tiles have some of the features of the larger expansions: Inns & Cathedrals, Traders & Builders, and Princess & Dragon. As always, you need the original Carcassonne to play with it, but you can use bits from the other expansions, too, if you like. This is a fun expansion that reimplements the earlier River expansion. You can use this river alone or in combination with the River I in order to make one large river for big, multi-expansion games. The River II adds in features that work with other Carc expansions (such as Princess and Dragon or Inns and Cathedrals), and can add a lot of depth to the game. Definitely a good buy at a cheap price. A great way to spice up the bigging of the game. 12 new river tiles indluding a river branch and two lakes. Great when combined with the River 1. Make a couple small rivers or one large one to start the game.